Since we are in the rainy season, the torrential downpours are coming every day, making the whole region like a river. Because the humidity is very high here, there is mold all around in our mission center and it causes many unidentified allergies and headaches. However, we believe that this situation is another joyful suffering for the kingdom of God, so we pray without ceasing as we need to fully rely on Christ’s Word in this particular situation. For the annual admission to our medical mission school, we admitted 14 students out of 28 applicants. Among the admitted freshmen are two students experienced as church directors, who also have been designated as directors of our mission college, while also being registered as students of our medical mission school. As a result of this, we now have 22 students (pictured right) who live with the two of us in the same building. As time went on we observed the true intention of those freshmen might be studying only basic medicine. They never heard about Jesus Christ and the true meaning of salvation. So there was some conflict in the first part of the semester when their Buddhism-based beliefs were in conflict with our Bible teaching, especially when the parents of the students had never permitted their children to know about Christianity. But, even with those obstacles, we saw God’s providence in this ministry since we witnessed a radical change in their attitude toward Biblical material. I think this came about because of our daily prayer and praise time among our students. Furthermore, several students confessed their sin and belief in Jesus Christ. This is all of God’s special mercy. Praise the Lord! Please keep on praying for our Christian students, that they can take their role in expanding God’s kingdom here in Cambodia, where Christianity is only one percent. We have had a work in Chutphura Island nearby the Mekong River. Now, because of the river, it has lost 80% of its site, which we bought about five years ago. It brings about a kind of sad situation that those Christians have lost their worship location. They are very disappointed by this. Please pray for them that they can recover their worship site by some means. 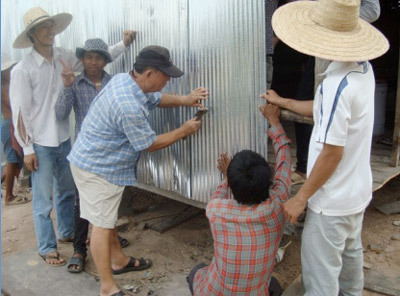 Although there was no significant damage in Siem Reap mission center, many neighborhood homes suffered damage. In the worst cases, some of them lost their homes completely because of the storm. As you can imagine they were in a very sad situation. One particular case was that of the family of a pregnant woman with her husband and nine children. Since their income was so limited in repairing the damage, some of our mission medical center students and those at CCMC, rebuilt the house (see front page). A week after that, the woman gave birth, and now the entire family of twelve has joined our church. We praise and glorify God that He gave us this wonderful opportunity to help our neighborhood as light and salt. By the upcoming year, we are planning on taking our furlough. It will be an opportunity to rest and gain some needed education. Specifically, we have a strong desire to take some English language courses as we felt that need in our ministry abroad. The period would start in March 2013. Please pray for our students that they may be spiritually equipped with the Word of God. Please pray for our school when we are facing shortage of funds for the scholarship and medical equipment for the medical practice as well as medicine. 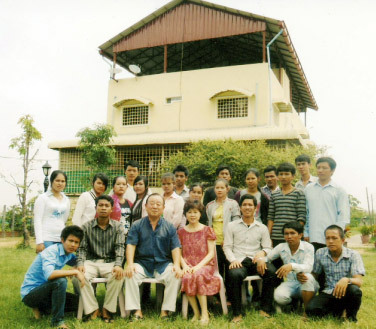 Please pray for the Chutphura mission field; they lost their church site so are in need of buying another. There are many new church members who have recently joined our church. Praise God! Now we need God’s providence in our leadership in this expanding situation. Please pray for the two of us as we look to a furlough time. We are in prayer that God’s blessings are over all our fellow Christians around the world.